Sleeve winter coat consist of detail at the top, a warming padding. These parts are interconnected in a different sequence depending on the processing methods. Insulating spacer sleeves can be made of cotton or batting. If you use a wool insulation layer overlapping the gauze on both sides. Details of gauze cut out detail lining the sleeves with sacanime front seams, propuska around 3 to 4 cm shrinkage when wystawianie. A layer of cotton wool lay, gradually reducing it to the lower shear sleeve. In the upper half (from the top part beyond the line of the elbow at 4 - 5 cm) layer of cotton wool should be thicker than the lower half. The thermal insulation layer overlap the gauze and wasteheat hand stitches on a sanding machine of the vertical lines from the middle of the sleeve in one direction and then in the other side with the distance between the lines 5 - b see Wasteheat wool for quilting.the M-12. After wystawiania insulated strip cut. Details of the processing of the batting strip they are covered with one layer of gauze, located in the side portions of the upper. Details of the batting cut out detail lining with sacanime front seams with an allowance of around 2 - 3 see the Second layer of batting podtraivaet only for the top half, it should not reach the bottom of the sleeves at 10-15 cm Wystawianie produce similar wystawiania warming layer of wool with the distance between the lines 10 - 12 cm. Sleeveless top with insulated padding and lining combine in various ways: fixing lining at the cuffs hand stitches used in the learning process; pritachivajut lining to the cuffs on sanding machine; applying the adhesive connection method insulation strip at the bottom of the sleeve. The elbow grind off slices from the lower halves with the upper landing at the level of the elbow seam width 1 - 1.2 cm In areas of the elbow seam from upper edge down to 12 - 15 cm from the lower edge up to 6 - 8 cm stitching details lining and insulating pads perform individually, and the rest of the seam together. The sleeves from the main fabric before connecting the lining and the insulation gasket is machined without bending the lower edge. Connection details start with pinning them on outside seams. For this sleeve the top of the turn on the wrong side, folding the bottom halves together and aligning the elbow joints. The seams of the insulation strip with the lining attached to the elbow seams of a top sanding machine or hand stitches, departing from the crown at 10 - 12 cm and not reaching the bottom of 6 - 8 cm. Then turn the sleeve lining up and straighten items in. The lower section of insulated strip down to the bottom line bending and attached to the strip slanted stitches. Cut the bottom of the sleeve bends along the line of bending of the lower edge in the direction of insulation strip, zametyvayut and hem slanted stitches over the insulating gasket. The lower section of lining straighten, bends and zametyvayut, aligning the seams of the uppers and lining. Suturing performed for bending the bottom sleeve blind stitch line loop-like stitches with a frequency of 3 - 4 to 1 cm. Turn the sleeve on the front side, straighten the parts inside and primetyvajut along the crown at a distance of 10 - 12 cm from the cut slanted stitches with the length of 2.5 - 3 cm, from the lower half. After the adhesive sleeve surplus warming padding, heat. Insulating strip cut, producing 0.5 - 1 cm (depending on density of insulation strip). The lining is cut, releasing it against the cut of the top part of the top of the sleeve in the top 1 cm and bottom - 2 - 2,5 cmIn the rest of the top part of the sleeve lining trimmed with a smooth transition from the upper to the lower parts of the crown. The connection pads and the strip with the bottom of the sleeves on a sanding machine (Fig. 99, b). The processing of the sleeves from the main fabric and the connection sleeve lining with insulated padding perform similarly to the first method, but with the following features. Strip cut shorter so that the lower section of the lining blocked the cut insulation strips at 2.5 - 3 cm, Front seam fixed to the lower edge. Lining scribbled on the insulated strip along the lower edge at a distance of 4 - 5 cm from the slice. Elbow seam of the lining and sew strips separately only on the upper cut. Then the lining pritachivajut to the lower cut sleeveless top from the lining seam 1 cm wide, equating front and elbow seams. Further processing - cover your sleeves, suturing seam protecive lining bottom to the lining, pinning the elbow joints and propityvanie details on top part and bottom is produced, as in the previous method of treatment. Adhesive bonding of the insulation strip with the bottom of the sleeves(Fig. 99,). Inside out sleeveless top with front seams sacanime imposes a pad on the bottom of the sleeves with double-sided adhesive coating. 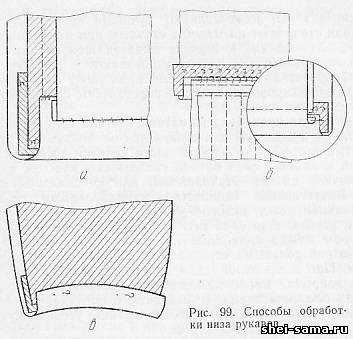 -The adhesive layer should not reach the elbow in slices 3 - 4 cm Top sleeve cover insulation gasket, with the lower section above the bottom line bending 1 cm the Lower section of the sleeve bends to the side pads, fasten with iron pins and iron or press with simultaneous bonding of parts. Then grind off the elbow joints of the top and insulated lining.After reputazione elbow joints top depending on the connection method of lining the product lining is combined with a lower cut sleeves on a sanding machine. Further processing of hoses produced as described above.